Fans Hobby gets their Powermaster on with the latest release in their Master Builder series; MB-06 Power Baser. This is a modern take on the Ginra/Super Ginrai design, or, Powermaster Optimus Prime depending on your tastes. I’m a big fan of the Japanese G1 continuity so this big guy will always be Ginrai to me. Fans Hobby has gone all out with this set including a full transforming trailer that is capable of both a base mode, as well as the Powermaster armor configuration. This review is based on a production sample that was sent to me by Fans Hobby. Power Baser comes packaged in vehicle mode, in a long slim box covered in full color artwork and photography. The vehicle mode is incredibly long, well over 12” with rolling rubber tires, and a functioning pivot at the trailer hitch. Weapon storage is provided on the sides of the trailer, and the top panel. Fans Hobby has chosen a more modernized aesthetic for Power Baser. The clean smooth surfaces of something like MP-10 or their own Gunfighter are not present, and in their place a more squared off, hard edged design reminiscent to me of the Maketoys Striker figures. Earth mode disguise isn’t a priority here, rather the design goes for a more aggressive machine style. Panel lines aside the cab is fairly clean, with most of the robot mode components well hidden within. The arms are really the only obvious components as they fold behind the main cab similarly to the original Ginrai/PM Optimus Prime. I think the look works as it homages the source material, and the arms fold up cleanly without any obvious hands or joints. The cab itself is roughly the same size as MP-10. Baser’s trailer is a gigantic piece of kit that plugs onto the cab via square pegs located on the back of the truck. The connection is not particularly strong, but allows for easy play with no stress caused by connecting and disconnecting the trailer regularly. The twin cannons included can be mounted on either side of the front of the trailer, as smoke stackers or to create a weaponized vehicle. Similarly the two large rifles can be pegged into holes on the roof of the trailer for storage or use in vehicle mode. Like the cab, the trailer for Power Baser is not shy about panel lines and hard edges. Given the functionality of the trailer this makes perfect sense and the styling is cohesive with the cab as well. The cab holds together brilliantly with no real weak points and aside from the combined mode head everything is well hidden. Transformation from cab mode to robot mode is a relatively simple process. For me the only piece that required referral to the instructions was the conversion of his front wheels into his abdomen. Everything feels very solid while transforming and I didn’t encounter anything that I foresee becoming an issue in the future. Robot mode is fun and pleasant to handle. There’s a ton of articulation and everything is easy to use without much of a learning curve. Aesthetically speaking we are again looking at a more modern, stylized take on the character that may conflict with individual tastes. The core figure is huge, standing at roughly the same height as MP-10 Optimus Prime. His size puts him at home in a Masterpiece display without question but the extensive tech detail, tampographed labels, and overall styling put him at odds with some of the more toon oriented figures. My only gripe with the bot mode is the gap created in the torso after transformation. Depending on your viewing angle you can see right through Power Baser which takes a little bit away from his otherwise powerful and aggressive design. Articulation on the core bot mode is slightly above average. - 360º rotation and outward swing at the shoulders. - Wrist swivel, and partially articulated fingers. - Ab crunch and waist swivel. - Universal hips w/ ratchets. - Single knee, 90º bend. - Inward ankle pivot and back tilt. I particularly like that his head is on a ball joint allowing for a ton of expressiveness. I’d have liked to see a double knee and a more versatile ankle joint. It can be hard to pose him more dynamic anime style poses without having to adjust his heels and stand him on his toes. From what I can tell there is very little die-cast in this figure. The only parts I was able to identify were the smokestacks as they feel cool to the touch. The lack of die-cast is noticeable when compared to other Fans Hobby figures such as Gunfighter. I’m sure it was done to prevent stability issues in the combined mode but I do miss the feel of nice die-cast feet at the very least. Just like the original toy, Power Baser is able to convert his trailer into a fully functional battle station. There’s not much more to say than what you can see in the photos. The base mode works well with titan masters and other small figures. The connections for the black guns on top are not very secure and could use a deeper port, or a different method of securing them. This is what we’re all here for, the fully combined Power Baser! This figure is absolutely massive when it is combined together. Standing at over 12.5” tall this is easily one of the largest figures I have ever handled. 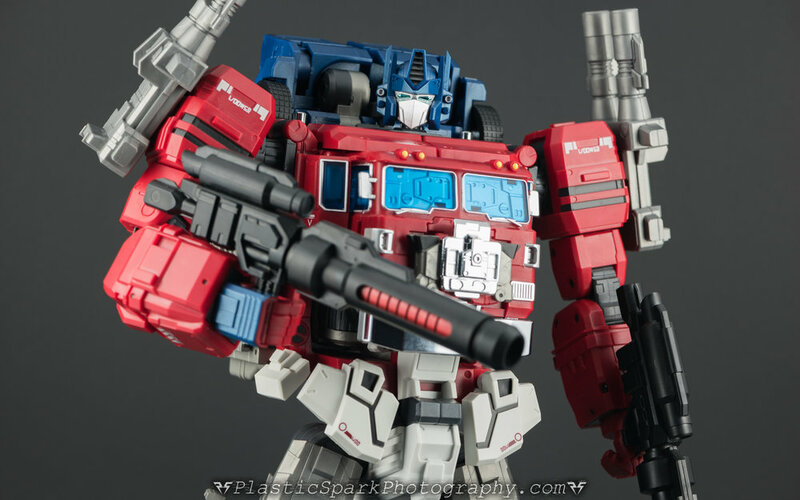 He stands on par or taller than other massive figures like MMC Carnifex, MMC Feral Rex, and Masterpiece Star Saber. The transformation of the trailer is fun and intuitive just like the core bot and the use of folding and sliding panels is very clever. The final product is clean and compressed despite the backpack and hefty appearance. Articulation is enhanced in this mode with everything from the base mode included and adding double jointed knees. The waist and ankles do not articulate to the same extreme levels but the joints are still there and function for anything I could want out of a bot this large. The same restrictions that I had encountered with the core modes feet are similar here. No outward pivot makes it incredibly hard to balance a good running pose. Die-cast feet also would have been appreciated in this mode but again I understand why Fans Hobby chose to go with an all plastic construction. Aesthetically speaking the combined mode is brilliant. He is large, intimidating, and heroic looking. The stocky proportions give one thoughts of a protective figure that may take a while to get moving but once he does, you want to get out of the way! The updated aesthetic is going to be hit and miss with some collectors just like the core bot. Power Baser will stand out on a shelf full of Masterpiece toon bots but I think he’s all the better for it. Personally I can’t wait for the additional trailer next year to complete Power Baser and make him even more awesome! 2 x Small Blasters – These guns are meant for the core robot and fit perfectly in his hands. There is no weapon storage on the core bot however they can be stored on the roof of the trailer. 2 x Rifle Barrels – Additional barrels to convert Baser’s smaller blasters into large rifles for the combined mode. 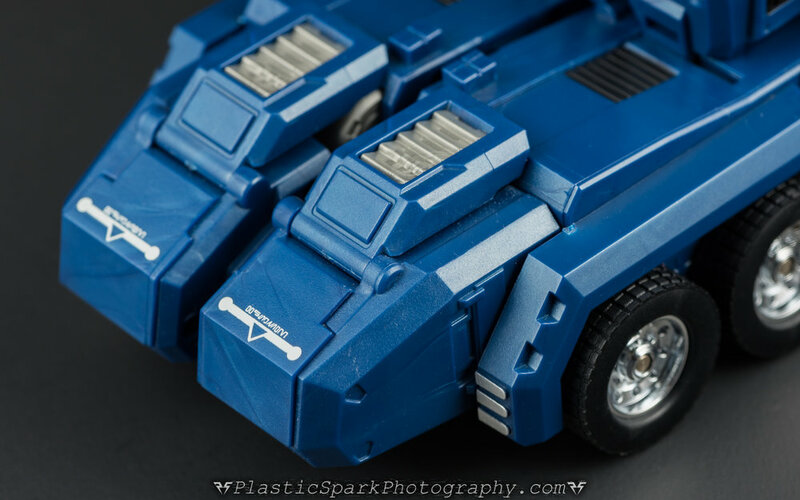 2 x Double Barreled Cannons – Mounted on the side of the vehicle mode, the combined mode shoulders, or wielded in hand these blasters are deadly looking. 1 x LED eye kit – Replacement eye components and a battery harness to add LED features to the combined mode head. *I will add photos once I am able to source the correct battery. 1 x Pilot – A poseable “Powermaster” style pilot for Power Baser. Decent articulation that is a bit limited due to the size and shape of the backpack. Don’t expect too many dynamic poses out of this guy but he can swivel his head, shoulders, elbows, thighs, and knees. I would have preferred a bit of paint applied to the pilots face as the pure white head looks a bit unfinished. The pilot can fold up into an engine block that can be mounted on the front grill of the vehicle, the front of the trailer, and on the back of the core bot in robot mode. Power Baser can also utilize any of the accessories included with previous Fans Hobby figures. I was able to have him wield the large crystal sword included with Gunfighter and it looks great in his hands. If you preordered Power Baser he will also come with a Die-Cast Energy Core, designed to resemble the Matrix of Leadership that is compatible with a large number of existing official and third party products. 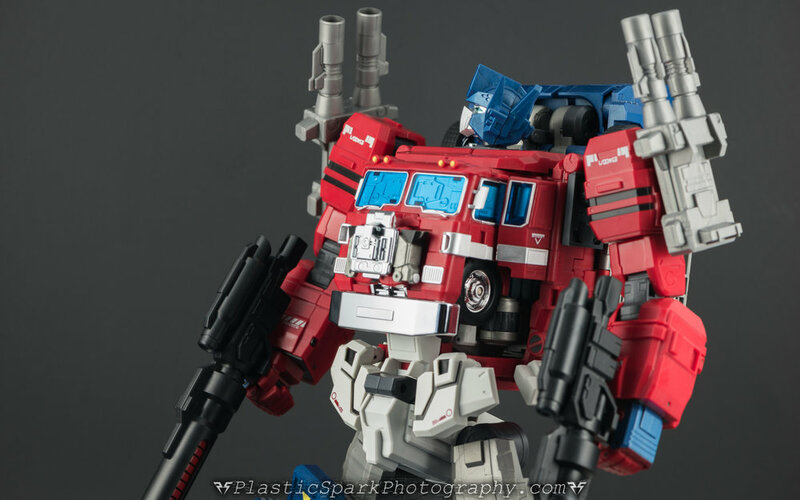 Fans Hobby Power Baser is unlike anything I’ve seen from Fans Hobby so far. The sheer size and scale of the figure combined with the above average articulation make it a treat to play with. This is a toy as much as it is a third party collectible and the real value of the figure can only be experienced in hand. A nuanced and intuitive transformation coupled with great paint and high end materials make this an absolute joy to handle and transform. There are certainly areas to be improved. My main concern is the ankles of both modes and I’m hoping this can be addressed when the add on trailer comes next year. Power Baser is an incredibly fun and aesthetically pleasing figure that absolutely earns my recommendation as long as you like the stylistic design choices like the tampograph details and modernized look. 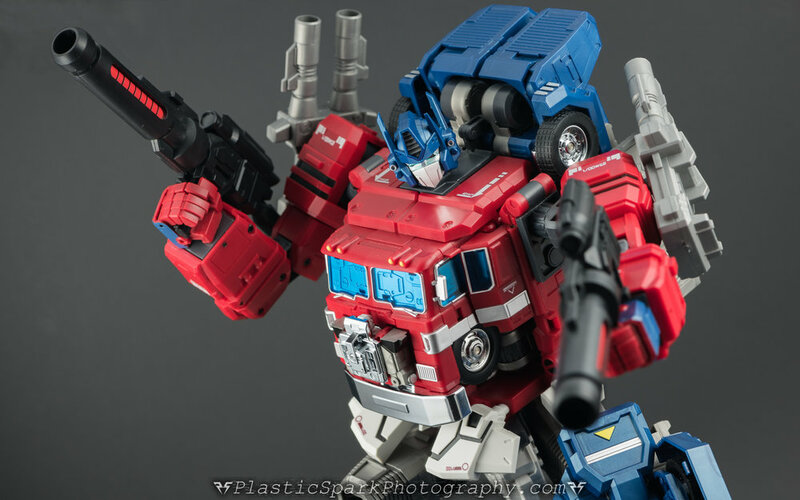 Thank you for taking the time to check out my review of Fans Hobby MB-06 Power Baser. I had a ton of fun shooting this figure and the gallery is pretty substantial. I'll be adding some more photos to the gallery once I am able to source the correct battery to show off the LED features and will also shoot a few more comparison shots once I dig some of my other figures out of storage. Let me know what you think in the comments section below the gallery and don't forget to check us out on Facebook! As always if you have any questions, comments, concerns or requests you can also email me at PlasticSparkPhotography@Gmail.com.